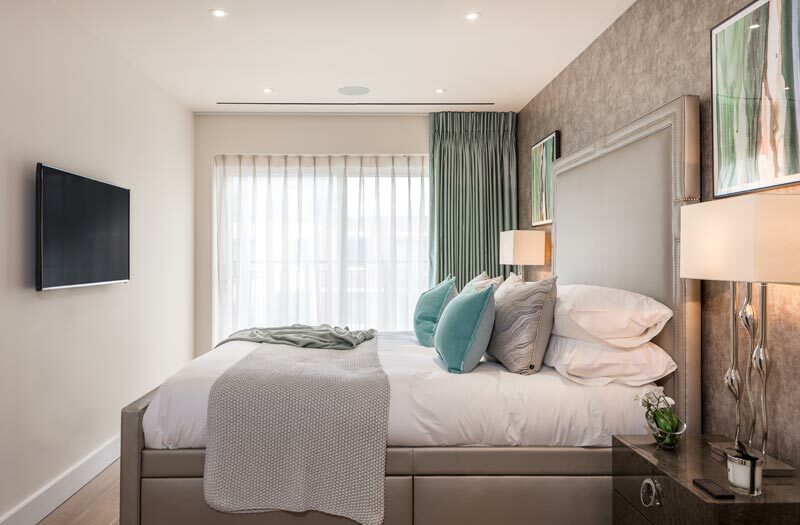 Elegant décor, rich neutrals and delicate touches of colour set the scene for ani M’s recent design project – a stunning apartment in Carvell House, North West London. Working with a completely blank canvas, the team envisioned a beautifully curated interior, with each corner of the apartment exuding timeless elegance and modern sophistication. 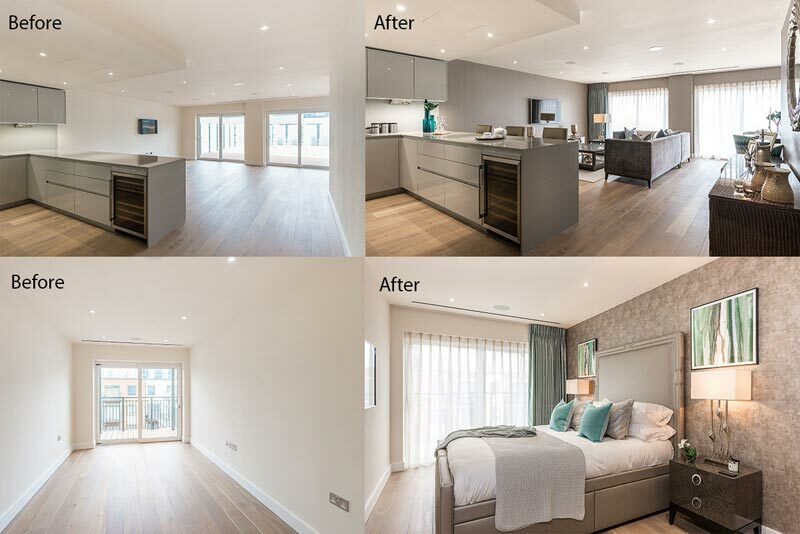 Already boasting dark wood flooring and a spacious layout, this new-build needed a designer’s touch to transform it from ordinary to stylish. 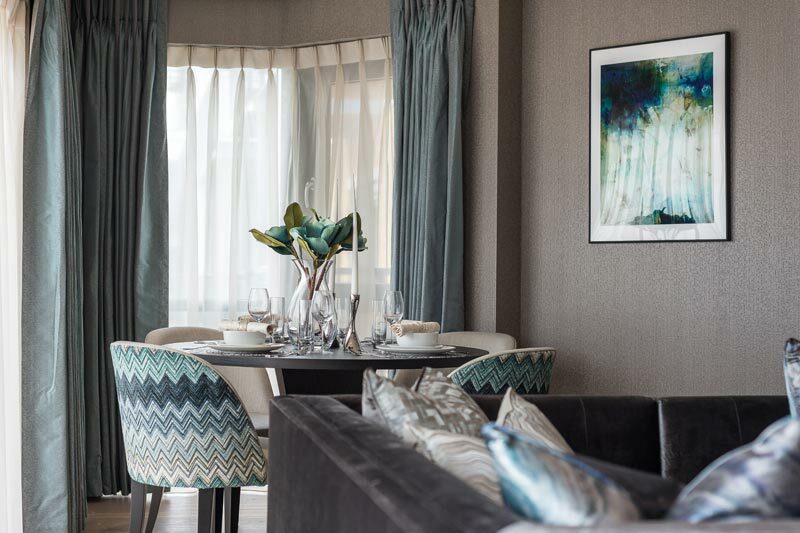 By choosing luxurious furnishings, decorative accessories and visually exciting textures and colours, the team were able to add depth and personality to the apartment’s open space. Referred to our team by Beaufort Park developers, St George, the client’s flexible and open-minded attitude gave our designers free rein to transform the space. A palette of soothing neutrals was chosen, and, overseen by our interior designer, the apartment’s dimensions and character soon began to take shape. In the living room, neutral tones and warm browns create a very calming space. 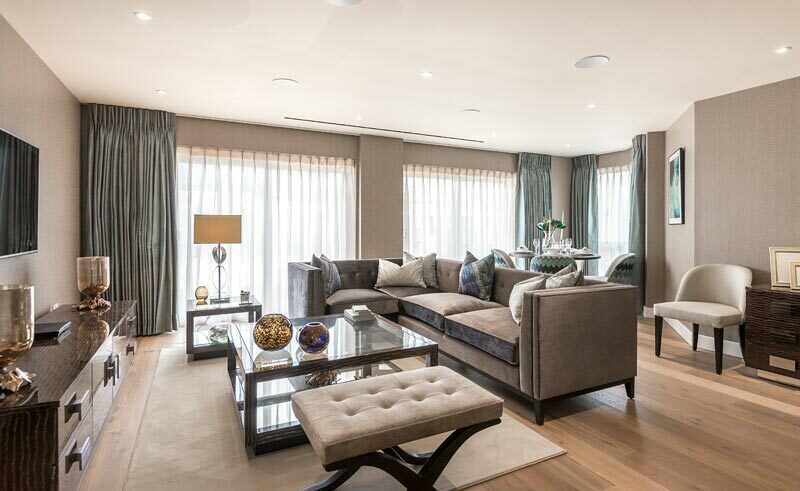 A lavish L-shaped sofa stands out as a focal point of a room, with other features such as a glass top coffee table, statement vases, a glossy lacquer cabinet and a beautiful, yet subtle cream carpet perfectly complementing the soft beige undertones. For a lovely contrast of colour, silver blue floor-to-ceiling curtains add an instant grandeur – their burnished metallic finish lending a warm, shimmering texture to the living room’s muted palette. Continuing the theme of delicate hues, the team styled the back of the room into a modern dining area. A round dark wood dining table is surrounded by statement-making accent chairs, complete with striking geometric upholstery and deep espresso stained hardwood legs. Classic silverware and a gorgeous vase centrepiece tie the corner together, with the floral arrangement adding an elegant finish. Together with the dazzling art piece and patterned pillows, cool blue shades set against a backdrop of soft neutrals make for a sumptuously contemporary aesthetic. With their exacting attention to detail, the team incorporated more statement décor pieces to the apartment’s interior. 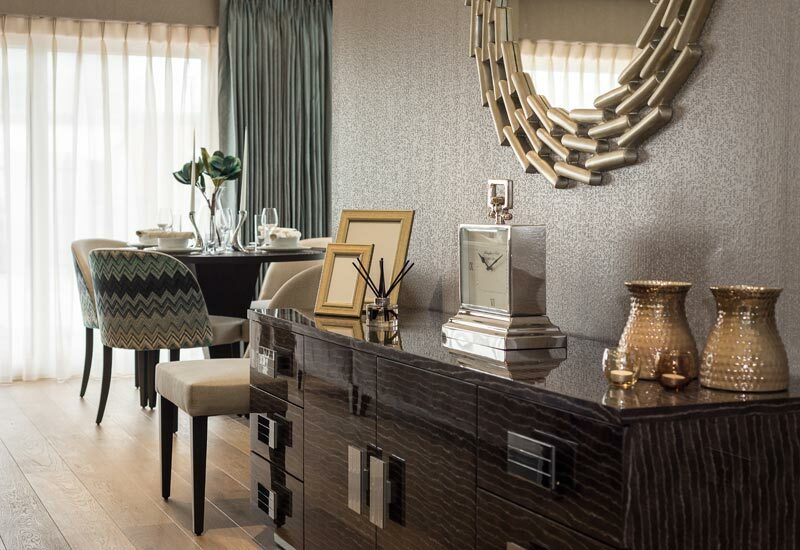 Metal vases, a silver mantel clock and ornate wall mirror bring an effortless sense of style. 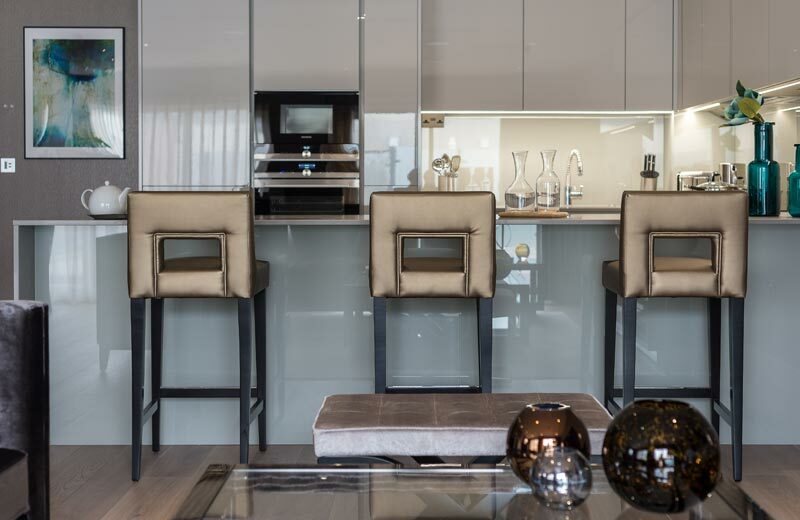 In the open-plan kitchen, barstools with a bronze quilted backrest offer comfortable perches where family or friends can chat with the cook, whilst decorative accents like an exquisite artwork and tall glass vases give the sleek cabinets and countertops a glamorous edge. In keeping with the blue accents in the living room and kitchen area, teal and turquoise hues stand out beautifully against a predominantly grey scheme in the bedroom. Bright aqua and marble patterned pillows are propped up against crisp sheets, a sublime contrast to the bed’s textured throws and light grey headboard. 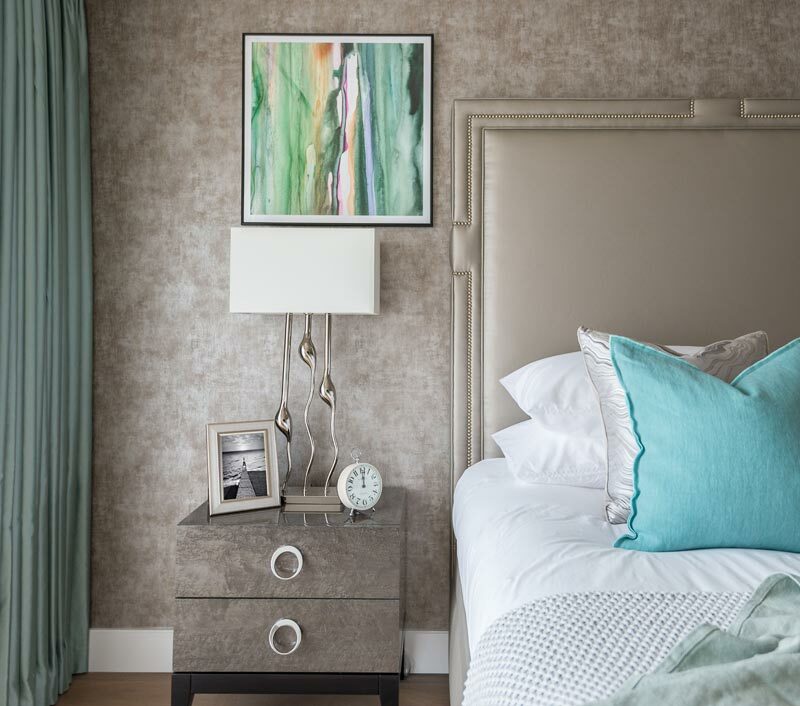 Abstract art and dainty bedside tables give the room a refined symmetry, offering a ravishing dimension to the grey textured feature wall. Special touches including statuesque lampshades and ornaments adorning the nightstands are the distinctive, characterful details that turn this bedroom into a soothing sanctuary. This and the assorted shades of grey instill a quietness and calm into the room, a feeling that is palpable from the moment you step inside. With an open, creative brief, the ani M team were able to translate their eye for design into a fresh, sophisticated living space for the client; a home that exudes character, charm and attention to detail at every corner. Need assistance in crafting interiors with timeless style? Get in touch with us today.